274 Marlborough is located on the south side of Marlborough, between Exeter and Fairfield, with 272 Marlborough to the east and 276 Marlborough (16 Fairfield) to the west. 274 Marlborough was designed by architect Francis R. Allen and built in 1879 by Woodbury & Leighton, masons, and McNeil Brothers, carpenters, as the home of Charles Greenleaf Wood, Jr. Charles Wood’s sister, Elizabeth, was the wife of Francis Allen, the architect. The Allens lived around the corner, at 20 Fairfield. Charles Wood, Jr., is shown as the owner on the original building permit application, dated May 21, 1879, and on the final building inspection report, dated June 21, 1880. The land on which 274 Marlborough was built was purchased on May 21, 1879, from Carrie E. (Ellis) Evans, the widow of Franklin Evans, by William Sohier and Henry G. Denny, trustees of a trust Charles Wood had established several years earlier to hold his property. The land was part of a larger parcel originally purchased from the Boston Water Power Company on February 16, 1863, by Daniel Davies, Jarvis Dwight Braman, and Grenville Temple Winthrop Braman. Grenville Braman was treasurer of the Boston Water Power Company, Jarvis Braman was his brother (and later president of the company), and Daniel Davies, a housewright and master carpenter, was Grenville Braman’s father-in-law. 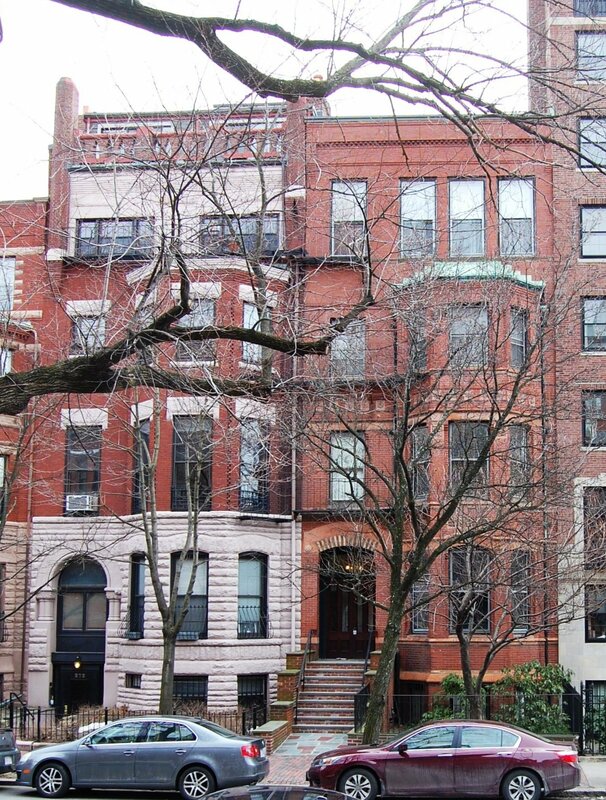 The eastern line of the lot on which 274 Marlborough was built was on the boundary between land originally owned by the Commonwealth of Massachusetts, to the east, and the Boston Water Power Co., to the west. There was a 0.37 foot discrepancy in the original deeds, with the Commonwealth deed placing the boundary at 95.20 feet east of the southeast corner of Fairfield and Marlborough, and the Boston Water Power Co. deed placing it at 95.57 feet from the corner. When she sold the land to Charles Wood’s trust, Carrie Evans accepted the Commonwealth’s line and the owners of the lots further west, fronting on Fairfield (all of which previously had been owned by Franklin Evans) transferred a 0.37 foot wide strip of land to Charles Wood’s trust, making his lot 24 feet wide. Click here for an index to the deeds for 274 Marlborough and for a plan of the original land. Charles Wood, Jr., married in June of 1879 to Mary Knight, and 274 Marlborough probably was their first home together. 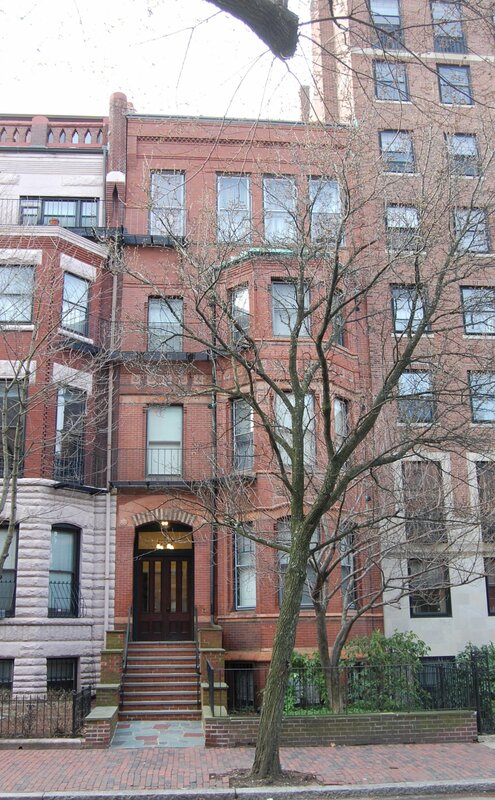 Prior to their marriage, he had lived at 11 Beacon with his widowed father; when Charles and Mary Wood moved to 274 Marlborough, Charles Wood, Sr., came to live with them. Charles Wood, Jr., was a terra-cotta manufacturer. His father was treasurer of the John Hancock Insurance Company. Mary (Knight) Wood was a pianist, music teacher, and composer of numerous songs. Charles and Mary Wood, and Charles Wood, Sr., continued to live at 284 Marlborough until about 1884. By 1885, Charles and Mary Wood moved to Easthampton, where Mary Wood had lived before their marriage; Charles Wood, Sr., also moved and by 1886 was living at 198 Beacon. By the 1884-1885 winter season, 274 Marlborough was the home of wholesale boot and shoe merchant Edward Little Fuller and his wife, Mary Lincoln (Doane) Fuller. They previously had lived in the Longwood district of Brookline. They continued to live at 274 Marlborough until about 1888, when they moved to 246 Marlborough. 274 Marlborough was not listed in the 1889 Blue Book. On April 25, 1889, 274 Marlborough was purchased from Charles Wood’s trust by Dr. William Whitworth Gannett, Jr., a physician. 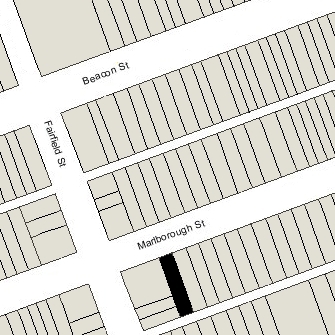 When it was built, 274 Marlborough consisted of three stories, and continued to be shown as such on the 1887 Sanborn map. Soon thereafter — probably about the time William Gannett acquired the house — a forth story was added. 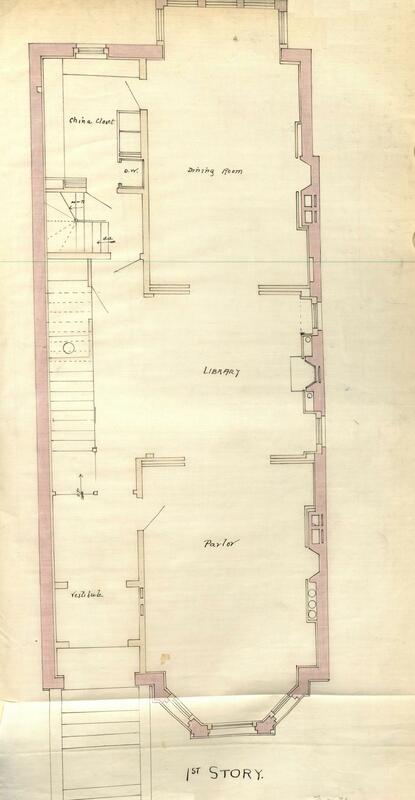 The new story included window openings and projections for fireplace flues in the party wall, and on October 11, 1889, Dr. Gannett entered into a revised party wall agreement with Fanny Morse, owner of 16 Fairfield, to reflect the changes. The photographs to the right show a partial view of 274 Marlborough soon after it was built (detail from a photograph of 272 Marlborough, on the left in the image, from The American Architect and Building News, 26Jul1884) and a partial view, showing the party wall, after the addition ca. 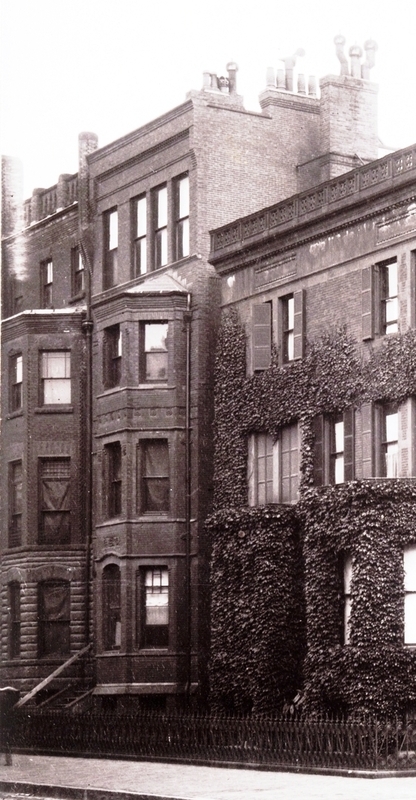 1889 (detail from a photograph of 16 Fairfield, on the right in the image, taken in 1902, courtesy of the Boston Athenaeum). William Gannett married in September of 1889 to Mrs. Harriet F. C. Bolles Hastings, the widow of Edmund T. Hastings. After their marriage, they lived at 274 Marlborough; he also maintained his medical office there. He previously had lived (and maintained his medical office) at 110 Boylston. Harriet Gannett died in December of 1889, three months after their marriage. He continued to live and to maintain his medical office at 274 Marlborough. After his wife’s death, William Gannett was joined at 274 Marlborough by Dr. George Grosvenor Tarbell, also a physician. In November of 1900, William Gannett married Mary Palmer Bearce. After their marriage, they lived at 274 Marlborough. Dr. Tarbell continued to live with them until his death the following month, in December of 1900. William and Mary Gannett divorced by 1914. Dr. Gannett continued to live at 274 Marlborough and she moved to 41 Pilgrim. In 1917, he married again, to Gertrude Bowie Maley. William Gannett died in April of 1929. Gertrude Gannett continued to live at 274 Marlborough, joined by her unmarried sisters, Theresa Booth Maley and Elizabeth K. Maley. They continued to live there until about 1947. On December 10, 1947, 274 Marlborough was purchased from Gertrude Gannett by James Costello. He and his wife, Margaret (McDonald) Costello, made it their home and also operated it as a lodging house (although the Building Department files do not include any record of a change in the legal occupancy from a single-family dwelling). On October 3, 1949, 274 Marlborough was acquired from James Costello by his sister, Ellen Gertrude (Costello) Hogan, the wife of Edward F. Hogan. They lived in Watertown. 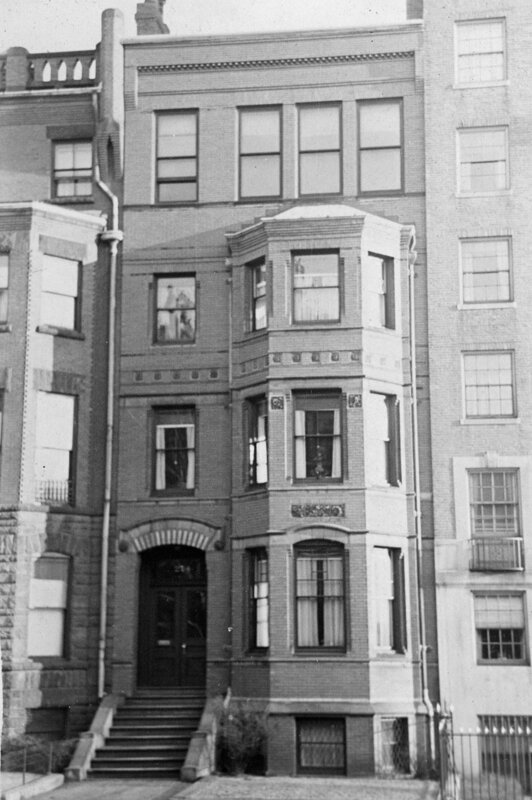 James and Margaret Costello moved to 240 Marlborough, which Ellen Hogan had purchased the next month, where they operated a lodging house. The property changed hands, remaining a lodging house, and on December 9, 1960, was acquired by Robert M. Freedman and Donald E. Devine, trustees of the Barline Realty Trust. In January of 1961, they applied for (and subsequently received) permission to convert the property from a single-family dwelling into ten apartments. The property changed hands, including going through foreclosure, and on March 22, 1976, was purchased by Maryfils, Inc. On October 27, 1981, it converted the property into ten condominium units, the 274 Marlborough Condominium.